Assistant Prof. Aaron Weinschenk’s Public Policy class enjoyed an opportunity Monday to hear first-hand from two veterans of the Washington, D.C., political scene. Former House Representatives Tom Petri (R) and David Obey (D), both of whom retired from Congress, visited the class to lecture and take student questions. The Congressmen visited Weinschenk’s class as the first stop in their Civic Participation Lecture Series. According to Weinschenk, “It is a amazing to have people of this caliber visit our campus. In a class focused on public policy, there is nothing better than hearing from people who were directly involved in the federal policymaking process for so long.” Wisconsin State Representative Eric Genrich, D-Green Bay, was also in attendance to provide introductory remarks and to introduce Petri and Obey. Weinschenk, a political scientist, thanked staff members Scott Berg, Rick Warpinski, and Katie Stilp for their help in planning and hosting the event. 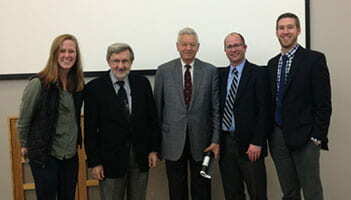 Pictured in the photo, above, from right, are Weinschenk, Genrich, Petri, Obey and the teaching assistant for the Public Policy class, Gretchen Klefstad. This entry was posted in News and tagged guest lecturer, Political Science, Public and Environmental Affairs on October 27, 2015 by Christopher Sampson.